The existence and functionality of the chakra system is the basis of many ancient practices such as acupuncture, martial arts, reiki and yoga. Each of us have seven major chakras that begin at the base of the spine and extend up the spine through to the crown of the head. These areas store energy and send it out through the meridians (a path through life-energy or your “qi” flows) to service the entire physical body. Chakras can wax and wane in their strength and vibrancy. They can even become blocked and stagnant like ponds that don’t have enough flow. So it’s not an exaggeration to say that complete health of body and mind begins and ends with the health of the chakras. Each of the seven major chakras deal with different aspects of the body, the mind and the soul, although all seven chakras are interconnected and interdependent. Probably the most common chakra to be in a weakened state is the First Chakra. 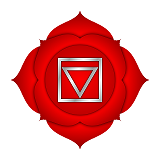 Sometimes called the Root Chakra, the First Chakra is located at the very base of your spine. It deals with issues of physical survival, safety and security and is blocked and weakened by fear and insecurity. Which is why it deserves some extra love and attention, because the First Chakra acts as a pump at the base of the chakra system that helps energy rise and flow. If this base pump is weak, work done on the other chakras won’t be as effective. 1. You feel a general lack of physical energy and vitality resulting in a lackluster will to create. 2. Your sense of well-being is highly dependent upon external circumstances. So long as everything is going smoothly and to your liking, you feel OK, but when circumstances aren’t to your liking, you feel insecure. 3. You feel a general lack of confidence in dealing with anything outside your comfort zone. 4. You believe that money creates security and that there is an amount of money that if attained, would guarantee your security. 5. You experience any of the following physical symptoms on a frequent or recurring basis: eating disorders, adrenal fatigue, foot and leg pains and injuries, rectal or colon problems, immune disorders or bone disorders. 1. Make a list of everything you tend to think of as providing your sense of security. Now cross off any items on that list that could be taken away from you without your permission. What is left? Anything? Now, make another list titled, “Things That Can Never Be Taken From Me.” You might have to reflect a little more on this list – but it’s worth the time to do so. These are the true source of your security. 2.Reconnect your body to the earth in some physical way. Walk barefoot in the dirt or go outside and sit beneath a large tree, resting your back against the trunk. Spend time reflecting on all the ways you are supported like nature. 3.Sing the word “grow”, holding out the “oh” sound as long as your breath allows. The word grow provides the proper vowel sound and has meaning related to the First Chakra. As you hold out the “oh” sound, bring your attention to the base of your spine and feel it vibrating and glowing red, sending life and health to your entire lower body. 4. Do the “Mudra Lock” breath. From any sitting position, inhale deeply into your lower belly. Now hold the breath in and tightly squeeze everything from your navel to your buttocks. Hold the squeeze for a few counts. Exhale, and with the breath held out, repeat the squeezing and holding for another few counts. As you are squeezing, try to feel the energy rising up your spine and reaching the crown of your head. Sit in a cross-legged position and grab your knees with your hands. Slowly rotate your hips and waist in a clockwise circle. Imagine that your navel is tracing as wide a circle around your seated center position as possible. Use your arms as leverage . Keep the movement slow and steady, breathing naturally but without trying to synchronize your breath with your movement. Breathe through your nose if you can. Continue this clockwise movement for twenty to thirty seconds. Now reverse the direction and begin in a counter clockwise direction, for another twenty to thirty seconds. About the Author: John E. Groberg is the creator of Spiral Up Yoga and the author of the book Spiral Up Yoga which teaches a simple daily self-care practice for body, mind and soul that is chakra-based and can be done at home by anyone, anywhere in just five minutes per day. Seven chakras. Seven days. One rule: Do something today for five minutes to strengthen this chakra.